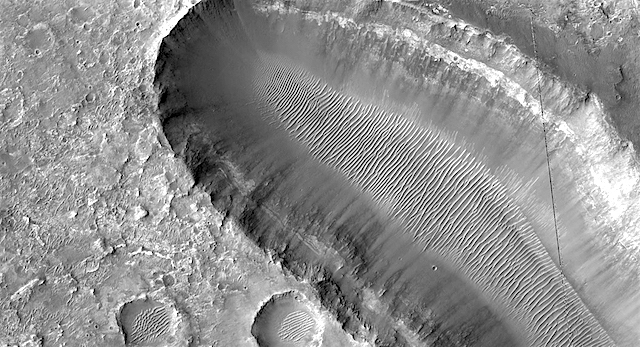 An elongated pit in Margaritifer Terra. There is nothing more interesting than a feature that resembles a giant amoeba. Margaritifer Terra is an ancient, heavily cratered region, centered just south of the Martian equator, and covers 2600 kilometers at its widest extent. This entry was posted in Reports and tagged collapse pits, High Resolution Imaging Science Experiment, HiPOD, HiRISE, HiRISE Picture of the Day, Margaritifer Terra, Mars Reconnaissance Orbiter, MRO, NASA, pits, University of Arizona, volcanics. Bookmark the permalink.